Skydiving costs vary based on many factors including the competition of other drop zones in the area, the type of jump, the altitude of the jump, type of aircraft and additional services such as video and still pictures. The best advice is the call around to all of the drop zones within 100 miles. Driving a little extra distance by be work the extra cost of gas. You can expect to pay about $200 for a tandem skydive. 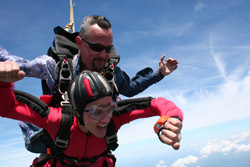 Some drop zones are as low as $160 for skydives during the week. About the most you’ll pay is $230 for a skydive on a Saturday. Of course, video services are additional costs as is t-shirts and other souvenirs. Accelerated Free Fall or AFF will cost a bit more than a tandem skydive. This is due to the additional cost incurred by the drop zone. AFF skydives involves a 4 to 6 hour class plus a jump with two instructors. The drop zone has to pay the instructors plus buy seats on the plane for the three of you. If you want to learn to skydive and fly your own parachute, there’s no better method to learn. The jump will cost about $315-$340. The skydiving video is a must have. It’ll cost about $60-$129. The wide range is prices is determined on what you get. A drop zone that mounts a camera on the hand of the tandem instructor is usually the cheapest. The drop zones that have a separate skydiver with a video camera and takes still photography camera is the most expensive. Expect to pay about $99. Skydiving is an expensive sport but gives you the thrill of a lifetime. You’ll never forget it and you can’t replicate it on the ground doing any other activity. So, shell out the $200 for a tandem skydive and the $100 for the video. You won’t regret it. After more than a 1,000 jumps, making the first jump was one of the best investments I’ve made in myself.